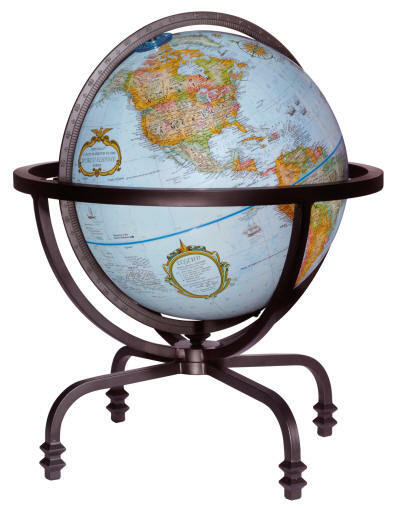 The Auburn world globe features a contemporary wrought iron base. Handcrafted with black matte finish and ornate legs. Full-swing meridian (ring supporting the globe) allows the ball to be turned 360° for easy access to thousands of points of interest from any possible angle. The 12" diameter fully up-to-date globe revolves within the meridian ring (East/West), and the meridian swings within the stand (North/South). Thousands of place names include continents, countries, capitals, biggest/important cities, bodies of water and more. Raised relief cartography enhances our understanding of the contours of our world. Time dial is located at the North Pole.